A thin, sometimes disjointed if gracefully written novella set in the remotest backcountry the Southwest has to offer. Blue Dog—a pound mutt with one blue and one brown eye and a habit of pilfering cooked food and massacring animals still afoot—has gone missing. Either that or, mutters desert/river rat Paul Nozik, “I spaced the dog.” Nozik knows the dangerous ways of the Green River, Brower (The Late Great Creature, 1971, etc.) lets it be known, and he has reason to worry about Blue Dog, who’s “gimpy” from having been shot “in the left hinder, for stealing chickens.” But Blue Dog, bless her heart, is resourceful: having fallen overboard, she makes it to shore, then stages a fruitful raid on another raft expedition’s camp. 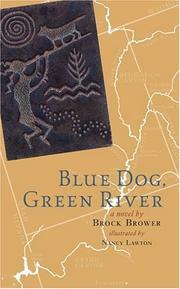 Blue Dog is lucky, too: where those who float the Green sometimes talk of seeing prehistoric Anasazi Indian ghosts, Blue Dog actually falls into the company of a mysterious Ancient One who bears more than a passing resemblance to Kokopelli, the humpbacked flautist of legend. The nameless Indian, “naked down to his think bones, with an old, leathery skin like sun-stiffened hide stretched over them,” is happy enough to share his store of jerky, which, Blue Dog soon learns, has ominous origins. Chased by storms and river-runners, old man and dog traverse wild country that gets wilder in the telling; Blue Dogs even acquires a few supercanine abilities, saving drowning rafters and scaling tall cliffs effortlessly. In the end, order is restored to the worlds of human and dog alike—even if Blue Dog now does what no human can do: namely, serve two masters. Told from several points of view, Blue Dog’s tale doesn’t always hang together, and, ultimately, there’s not much to it. But Brower—who, it appears, hasn’t been heard from much in 30 years—writes with exuberance and assurance, and readers who know the canyon country (and chicken-thieving dogs, for that matter) ought to enjoy this strange story.